Latex beds have a reputation for good back support and especially good pressure relief, as well as being a more natural mattress choice. The Zenhaven mattress is a natural latex bed available online for a fraction of the cost of a mattress-store model, but does it balance quality and value, and is latex right for you? Note: Zenhaven is made by the Saatva Company, one of the most well-established companies that sells mattresses exclusively online (since 2010). In addition to the Zenhaven all-latex mattress covered in this review, they also offer the flagship Saatva mattress, a coil-on-coil innerspring lineup, as well as the Loom & Leaf memory foam bed. If you’d prefer to watch rather than read, check out our full Zenhaven mattress video review above. GoodBed's Take – Who is the Best Match for a Zenhaven Mattress? The Zenhaven mattress is a natural latex bed made from layers of material processed from the sap of rubber trees. (The trees are not harmed in the process.) This type of bed appeals to those who want or need to avoid as many chemicals as possible and place high value on eco-friendly manufacturing and products. The Zenhaven latex mattress is unique in that it’s designed to be flipped, and each side of the bed has a different comfort level. The company calls one side “luxury plush” and the other “gentle firm,” claiming that there’s an 18% difference in softness between the two layers. Practically speaking, we noticed a subtle difference between the two, but enough that stomach sleepers will likely prefer the gentle firm side, while side sleepers should experience the best spinal alignment from the luxury plush side. Flippable mattresses are rare these days, so it’s a fairly unique characteristic. The Zenhaven website has a great page on how their latex layers are made. This is a10-inch mattress, with a support core of about 5 inches of latex, sandwiched between 1.5” comfort layers of latex. The top and bottom of the bed are lined in a 1” thick piece of New Zealand wool, which acts as a natural fire retardant (other mattresses use chemical retardants, which are required by law), and is encased in an organic cotton cover that feels sturdy and substantial. In our evaluations, the Zenhaven mattress particularly excellent for back and side sleepers, with our tester maintaining excellent spinal alignment and experiencing no “hot points” or pressure points. This is a quick responding mattress that, while it may look like memory foam, does not behave like memory foam at all. Rather, it springs back very quickly to its original shape. As a result, we feel it’s a great choice for those who are sensitive a partner’s movements in bed. In our tests, movements on one side of the bed were barely detectable on the other. Performance-wise, this definitely isn’t a bouncy mattress, with none of that slow sinking or “hugged” sensation that some prefer. Rather, the feeling is more of floating atop the mattress than sinking deeply into it. Another highlight was ease of movement, or repositioning. Our tester commented that he felt he was “rolling downhill in both directions” because it was almost effortless to roll to a side-sleeping position. Assuming that those considering this mattress prioritize natural materials and lack of chemicals in their bedding, it’s worth noting that the latex used in this bed isn’t organic; it is possible to find organic latex mattresses certified by GOLS, but those mattresses are typically a lot more expensive than the Zenhaven. And of course, those with latex allergies should certainly avoid this mattress. Given that, the Zenhaven mattress’s price is very competitive among latex models, especially given what we judged to be its high quality materials; free shipping is included, along with in-home setup and removal of your old bedding, a “white glove” service that typically costs $100+ extra with other brands. The 120-day trial period should give shoppers some peace of mind but note that returning the bed invokes a $99 service fee for pickup. You can place the Zenhaven mattress atop the support of your choice, including a separately purchased box support, a bed frame, platform bed, or adjustable bed frame. The company sells its own foundations, along with the Lineal Adjustable Foundation. Overall, the Zenhaven mattress performed well in our testing and evaluation for pressure relief, back support, and heat transfer. It was exceptionally easy to change sleeping positions, and motion isolation was nearly ideal. The Zenhaven mattress is one of the few of today’s mattresses that’s designed to be flippable, and the two 1.5” latex comfort layers have slightly different softness levels. The company called them “luxury plush” and “gentle firm” and claims there’s an 18% difference in softness between the two. That means that owners have two choices; if the luxury plush side feels a bit too soft, they can flip the mattress to the gentle firm side. We’ll talk more below about this unusual aspect of the Zenhaven mattress. Each latex layer is pierced by pinholes to adjust the density of the latex and to promote airflow. The wool layer is a natural fire retardant (required by law) instead of chemical additives employed by most other mattresses. Wool also has heat regulating properties (have you ever tried wool socks?). As its support core, the Zenhaven bed features 5” of natural latex in two layers. Covering the Zenhaven mattress is a quilted cover made of organic cotton treated with Guardin, a plant-based antimicrobial compound. The Zenhaven mattress is flippable, and each side of the mattress is a different softness. The luxury plush side is used by 80% of its customers according to Saatva, and that is the side we primarily tested. We did also sleep on the other side, called gentle firm by the company, who claims there’s an 18% difference in softness between the two sides. In practical terms, we did not notice a huge difference in softness between the two sides. Overall we would class the luxury plush side as Medium, and the gentle firm side as just to the firmer side, or Medium Firm. Despite the two softness levels on either side of the Zenhaven mattress, we noted that cushioning depth seemed consistent between the two. Cushioning depth refers to how deeply you sink into the mattress versus more of a floating-on-top feeling. We experience a bit of nesting feeling, but not much, on both sides, leading us to class cushioning depth as average in the case of the Zenhaven latex mattress. Responsiveness refers to how quickly a mattress recovers its shape after being compressed. When you press your hand into the mattress, for instance, then remove it, does it take several seconds for the mattress to return to flat, or does it recover immediately? Memory foam, for example, is known for its very slow recovery, giving you that slow, melting into the mattress feeling. Innerspring mattresses, on the other hand, tend to recover immediately. The Zenhaven latex mattress falls into the latter camp, with no memory feel and very quick recovery. Bounce is another aspect of responsiveness. Some people enjoy a little bounciness in their mattress while others don’t. While the Zenhaven mattress does have a little bit of surface bounce (it is made of natural rubber after all), this is not a bouncy mattress. When our 200-lb. tester plopped his weight on the bed, he didn’t bounce at all. We primarily tested the luxury plush side of the Zenhaven latex bed, as that’s the side 80% of its customers choose, according to Saatva. Overall we thought that the Zenhaven mattress offered very good support, especially for back and side sleeping positions. When on his back, our tester felt that his hips sunk into the mattress just the right amount, yet his lumbar area felt supported. Flipping the mattress to the gentle firm side, our tester had the same view: very good back, lumbar, and hip support. For side sleepers, we felt that Zenhaven mattress would also be a good choice. If you are primarily a side sleeper, we found the luxury plush side to offer a bit better support in this position, with heavier parts of our tester’s body sinking down while leave concave parts, like his waist, support, resulting in very good spinal alignment. If you are primarily a stomach sleeper, however, our tester found the gentle firm side to be more appropriate. With a too-soft mattress, hips and midsection can tend to sink too much, forcing the back to over-arch and opening the potential for back pain. For that reason, stomach sleepers should prefer the gentle firm side of the Zenhaven mattress. Our 200-pound tester felt very well supported while on his back, with very good spinal alignment and lumbar support. Lighter and slightly heavier people should have a similar experience, while those over about 250 lbs. might want to choose the gentle firm side of the mattress instead. Spinal alignment for our tester in the side position was very good, noting that his shoulders and hips sunk appropriately into the mattress, resulting in a neutral spine position. Overall, we felt that the Zenhaven would be a good match for most that sleep in a side position, especially if used on the luxury plush side. Achieving good spinal alignment for stomach sleepers can often be trickier as the hips can tend to sink down too far with some mattresses, and we found that to be a concern with the luxury plush side of the Zenhaven latex mattress. However, our tester experienced much better spinal alignment as a stomach sleeper from the gentle firm side of the mattress. Overall, we found the pressure relief offered by the Zenhaven mattress to be excellent, and our tester experience no hot spots or pressure points at all. On the gentle firm side of the bed, our tester also found pressure relief very good, but it was truly excellent on that luxury plush side. For a wide range of sleepers, we felt the Zenhaven mattress would offer exceptional pressure relief. With a bowling pin standing upright on the Zenhaven latex bed, we tested motion isolation by dropping a 16-lb. bowling ball on it; the bowling pin barely moved at all, and remained upright. Similarly, when our tester dropped his full weight onto the bed, the pin remained practically motionless. If not feeling your partner’s movements on the bed is a high priority, the Zenhaven bed performed exceptionally well in our tests. If you are a “hot” sleeper, or perhaps a woman who experiences hot flashes, how a mattress affects your body temperature may be a concern. Latex in general is less heat-retaining than memory foam, so if you are deciding between this two types, and heat is a priority for you, latex has some natural advantages. Saatva designed the Zenhaven latex bed with pinholes through each layer of latex, helping promote air flow. And the 1” layer of wool on either side of the mattress serves as a natural heat regulator. Have you ever tried wool socks? They tend to keep your feel both warm in winter and cool in summer, channeling heat away from the body. Overall, we felt that feeling hot on the Zenhaven bed really would not be a concern for the majority of people. In our tests, which you can see in our video review above, our tester felt very stable while sitting on the edge of the mattress, even though the mattress claims no specific features to enhance edge support. While the mattress did dip under his weight, the amount of dip was not as much as one might experience with memory foam. Laying right along the side of the mattress also felt very stable. If you find yourself being forced to the side of the bed by pets or kids, this will be a consideration for you. Our tester felt like he was leaning a tiny bit off the mattress, but not enough to be of concern or to affect his stability. One of the highlights of the Zenhaven mattress, for our tester, was ease of movement, and he noted that he felt like he was almost rolling down a hill whichever way he rolled to his side—that’s how effortless it felt to move around on the Zenhaven mattress. If you are shopping for a latex mattress, environmentally friendly features, as well as avoiding the presence of off-gassing and contact with chemicals is most likely a priority for you. Latex is an all natural material made from the sap of rubber trees. The latex used in the Zenhaven is the higher quality talalay type of latex. While the company says that it is 100% natural latex, and that is mainly true, the company does add some treatments required by law. Even so, the latex used here is as close to 100% natural as you will find. It is not, however, organic latex. You can certainly find organic latex mattresses. An organization called GOLS regulates and certified latex as organic. But keep in mind that organic latex mattresses cost substantially more than the Zenhaven bed. The wool layers are organic, however, as is the cotton used in the mattresses cover. The company does note that it must use a small amount of chemicals to process the rubber sap into latex, and to ensure that layers stick together. Zenhaven also has stated company policies regarding the use of sustainable harvesting techniques as well as initiatives it has taken to reduce the carbon footprint of its factories in the United States. We did not test the Zenhaven with an adjustable base. However, the company does sell its own adjustable base called the Lineal (see our separate review of the adjustable base) that is compatible with the Zenhaven bed. For that reason we assume that compatibility with an adjustable base should be good. Foundations are available in two heights, an 8.75” version and a low profile 4.75” version. You can also use the Zenhaven mattress on top of a platform bed, or on an adjustable foundation, including the company’s own version. The Zenhaven is a 10” natural latex mattress that is uniquely flippable; each side of the mattress offers a slightly different softness level. We found the luxury plush side best for back and side sleepers, while the gentle firm side would likely be a better choice for back and stomach sleepers. 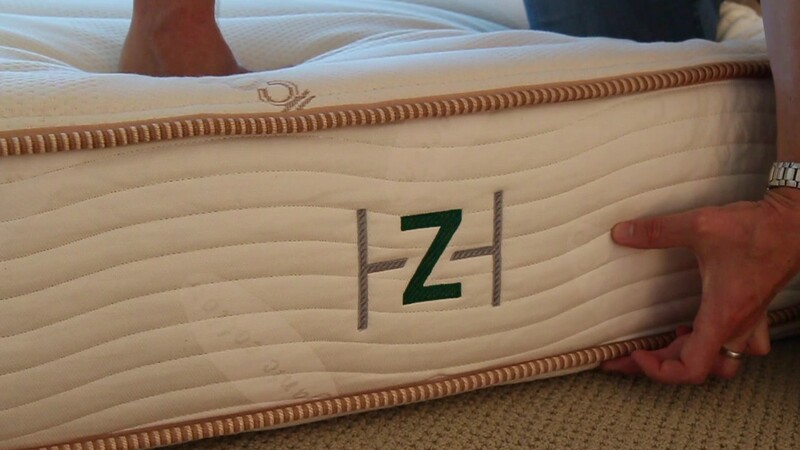 In our tests, the Zenhaven mattress proved exceptional in terms of pressure relief. Ease of movement and motion isolation also received very high marks in our tests. We pulled and tugged at the mattress and found it to be well constructed and solid. As a latex mattress, the Zenhaven also boasts eco-friendly materials and construction, with 100% natural talalay latex (though not organic), two layers of 100% New Zealand wool for fire retardance and heat regulation, and an organic cotton cover. The company also has well-stated company policies and initiatives regarding sustainable harvesting and carbon-footprint reduction. We believe the Zenhaven bed will last a long time. While the company does not state the density of its latex layers, we judged them to be in the 4-lb to 4.5-lb range, of good quality and durability. The mattress’s cotton cover was tugged and pulled in our tests and we found it to be well made and sturdy. Pricewise, the Zenhaven latex mattress stacks up very well against its latex competitors. Choosing to use standard latex instead of organic latex certainly keeps the total cost lower, as organic latex mattresses cost much more in stores. While the Zenhaven costs more than, say, a memory foam mattress you might also find online, including the company’s own Loom & Leaf memory foam mattress ($1,099 queen size), memory foam mattresses are neither chemical-free nor natural. So in the ecosystem of natural mattresses, we believe the Zenhaven mattress does present a very strong value. Compare Zenhaven mattress pricing online. 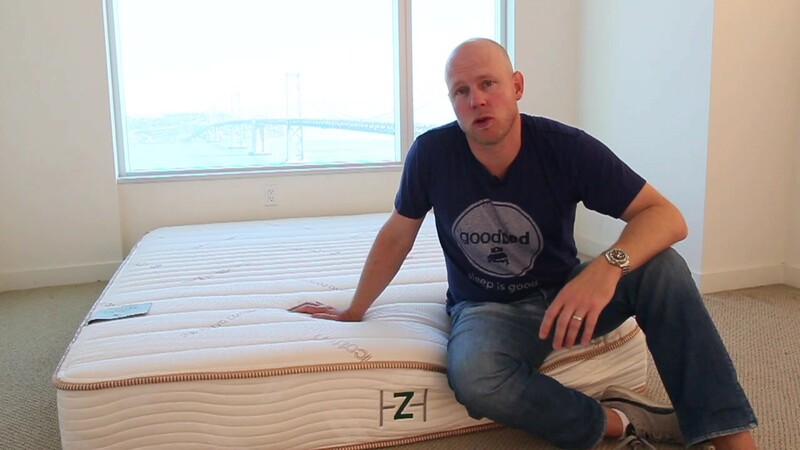 When we first reviewed the Zenhaven mattress in our video above, there was a $99 delivery charge. The company has since changed its policy to include free shipping, free in-home setup, and free removal of your old bedding. This is a policy that now matches or exceeds that of the majority of Zenhaven’s online competitors. Zenhaven offers buyers a 120-day trial period. Should you decide to return the mattress during that period, there is a $99 fee for pickup. Some context: The Zenhaven mattress is a piece of furniture, delivered by movers with a truck. You can see how returning this type of mattress is a more expensive proposition for a company (and ultimately for you). Even so, several of the company’s online competitors do offer free returns within the trial period. One of the biggest, if not THE biggest complaints about any mattress from consumers regards body impressions—the inability of a mattress to spring back, eventually creating a low spot/sinkhole in the mattress. As such, mattress warranties all contain a term defining how big a sag or ‘body impression’ (measured when no one is on the mattress) is considered a defect, and thus covered under the warranty. The industry standard for mattresses is generally between ¾” and 1.5”. Zenhaven has chosen to cover indentations that meet or exceed 3/4”—a comparatively very generous indentation policy. Practically speaking, that means any softening or sagging would need to be at least that deep before the warranty would offer you protection. For the first two years of ownership, Zenhaven will replace your mattress (including shipping) if it falls under warranty coverage for no charge. For years three through 20 of the warranty, the company will repair and re-cover your mattress, but consumers are required to pay a $99 shipping charge each way ($298 total). Check out the Zenhaven warranty. Summary: Is the Zenhaven Mattress Right for You? Overall, we found the Zenhaven mattress to be of high quality and a particularly excellent value among latex mattresses. Based on our findings, here’s who we think is the best and worst match for a Zenhaven mattress. Is the Zenhaven bed right for you? Take our Mattress Match Quiz to find mattresses that fit your needs, based on your preferences and price range. Looking for a little more on the Zenhaven mattress? Visit Zenhaven.com.